Ztracená Street in Olomouc. 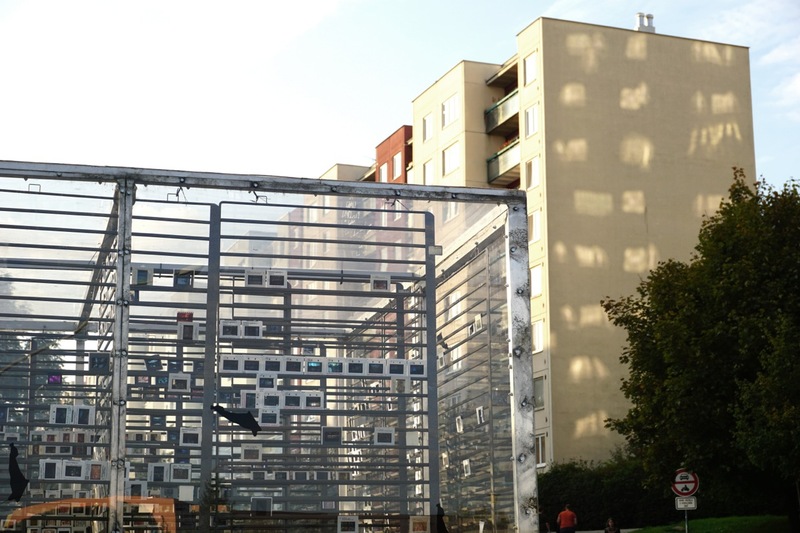 A public projection of the trailer PUBLIC COLLECTION_CZ is presented at the Septembeam festival. 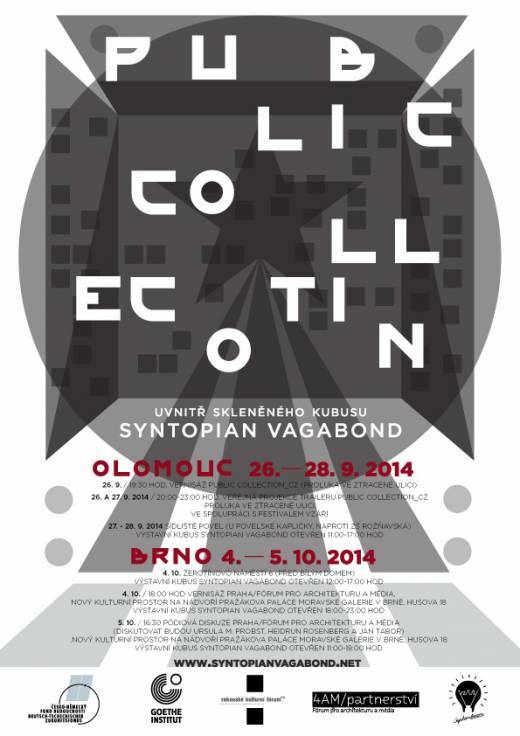 The installation runs in the mobile cube of the SYNTOPIAN VAGABOND on September 27 – 28, 2014 – 11 a.m. to 5 p.m. – in the housing estate Olomouc-Povel (near by Povel-Chapel). October 4: Žerotín square 6 – 12 a.m. to 5 p.m. 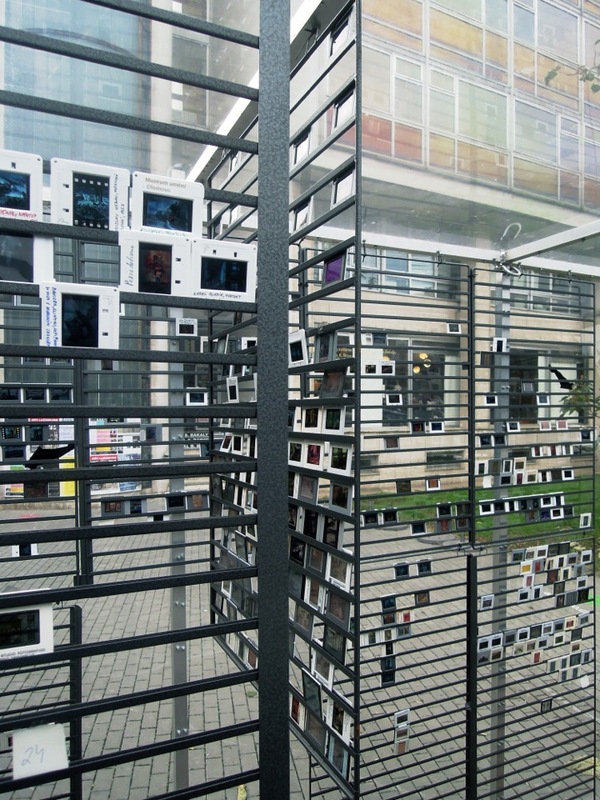 Opening: PRAHA/Fórum pro architekturu a média Husova street 18, Brno – 6 p.m. to 11 p.m. The PUBLIC COLLECTION_CZ is a project by Michaela Rotsch (fine arts), Juliane Zellner (metropolitan culture) and Lugo Rob (media) in cooperation with the Czech team Michaela Rýdlová, Sabina Soušková, Lucie Valdhansová (Fórum pro architekturu a média). The PUBLIC COLLECTION_CZ is based on a gap in a dia – collection discovered at a garbage dump in Munich. The huge inventory of the slide collection shows icons of European art history from antiquity to the present, but not a single image of the art of the socialist era. – a kind of a void in 20th century art history. But it was precisely at this time in the 20th century that the slide medium was in its heyday. The gap in the collection takes us on a journey to the Czech Republic, one of the original countries of socialist art. The main question of the research was: what position does socialist art have in public and private collections in the Czech Republic today? The “findings” of this research will be made accessible to the public in the cities of Olomouc and Brno. In exchange with passers-by the PUBLIC COLLECTION_CZ will be created and reflected upon in a public discussion with experts in architecture, visual culture and art history.